Again on display after an exemplary restoration, Manège de cochons is one of series of paintings of scenes of modern city life, of popular entertainments in particular. 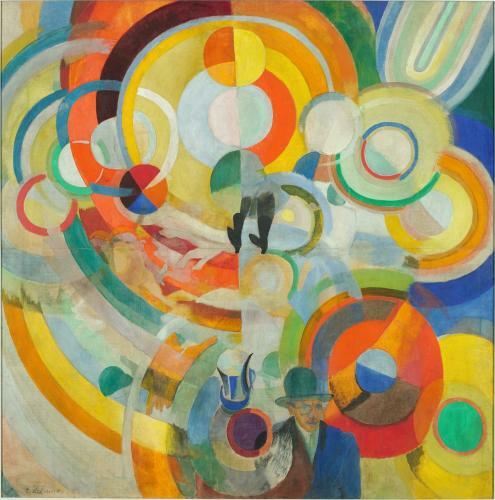 The turbulent rotation of the multi-coloured circles draws the viewer into the frantic motion of the roundabout. In the middle, a pair of black-stockinged legs caught in a whirlwind of colour captures the raucous atmosphere of the fairground. Recognizable in the foreground with his monocle and bowler hat is leading Dadaist Tristan Tzara, making his way through the festivities and recalling the Delaunays’ close engagement with poetry.